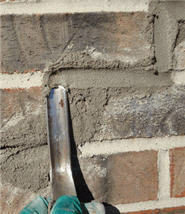 Over time, and given cold temperatures in particular, the mortar joints around the brick may need to be repaired. If they are cracking or crumbling in areas, leaving them in a state of disrepair - this can potentailly worsen the problem by letting in the elements, so it is best that the problem be corrected. However if cracking is being caused by structural issues, those clearly need to be corrected first. Otherwise it may simply resurrect and call for repointing again. 1) Clear the joint. This is done by a hammer and cold joint chisel. To do this, strike with a hammer, preferably a ball-peen, in repeated knocks with moderate force as you proceed in a single direction. Applying hard blows can lead to further damage on the brick. The brick-to-mortar bond should be relieved without scaling or chipping the brick edges. Lessen pressure on removal by removing layers in to the joint, not all at once. 2) Clean the joint. Remove the loose dust and particles with a slim duster brush or forced air. 3) With a hand held spray bottle, and perhaps a thin brush to force in moisture deeper, dampen the opened joints. The surfaces must absorb the damp water for the strength of the new bond. 4) Mix the mortar [ see tuckpoint notes ] and pack it by way of a hawk and a joint blade, pushing mortar out onto the lengthwise opening. A trowel end can be used on the vertical joints. The mortar is to be packed flush with the brick surface. An alternative is using a mortar bag. Filling the bag and squeezing the mortar into the joints. If not too thin of a consistency is being packed this moves along considerably. 5) Finishing the joint. For this you mill need to locate the correct tool and match it too your joint type. For most newer homes, this often means a concave shape, although it could be 'V' shaped, made flush with a trowel, or raked at a constant inset, to name a few. After the joint is packed, form the new countour by running a wetted joint blade over the packed joints. Dipping the metal tool in water slickens the surface, overcoming the surface drag and this forms a nice clean contour (overwetting however can dilute the masonry). 6) Clean off excess mortar from the bricks. It is important that the residue be not allowed to dry and cure since removing later will not be as easy.